BY HIGHER spiritualism we do not mean that which is occupied with occult, curious or magical phenomena. Such spiritualism keeps man away from progress. Higher spiritualism is that in which the soul is enkindled and illuminated. The petals and leaves and thorns of the rose are all different, and yet there is one rose; the spirit of the rose is one, these parts are so many aspects of the rose. In the same way all spirits are different, but are the outcome of the one real Spirit. In reality there is only one Spirit and it is only because of a sense of illusion that there seem to be many spirits; every ray of the sun is accounted as separate from every other. The whole world is wonderful and we need hardly take special steps to find wonders and miracles by going to seek special phenomena. There is no end to the wonders around us! Our life consists of so few days that, if we realized the privilege of life and were thankful for its opportunities, we should devote our time to attaining what every soul really longs for, rather than taking interest in the curious and the occult. After all, those phenomena do not differ from the everyday phenomena we call natural. Human character, human life, the breath we take, our states of pleasure and displeasure, of like and dislike – what are they all but phenomena? The craze for a particular phenomenon leads us to overlook that the whole universe is activity. Christ was not pleased when asked to show a miracle. He did not summon the angels to satisfy the curiosity of his disciples. It was spiritual illumination which was their real need. However good an education may be, it does not follow that the soul is kindled and, unless the soul is illuminated, how can it illumine another soul? When two such souls should meet it is as lighting a candle. But a match will not kindle a piece of iron; it requires very much heat to do so. So souls which are not awake are very difficult to illumine. Persons may quarrel and fight over what they believe and disbelieve, but were the soul kindled such fighting would be found to be of no avail. Forms will always be different; it is the real meaning and essence which is unchanging. Seers are always united in their thoughts because they perceive that the truth is one, and the Spirit is one; other persons have only knowledge of names and forms. When there is only one Spirit and one life, how can there be two knowledges? The spirit of Buddha's teaching, of Solomon's teaching, of Christ's teaching always point to the same meaning, and yet how different their words and how different their lives. Even of one person or of one picture ten persons will have different ideas. This world of variety, always changing as it is, cannot be the basis of unanimity. Only when we come to a knowledge of the One Being can we be led to higher spiritualism. 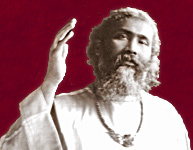 Those souls who have departed from this life in the absorption of the vision of God, the Only Being, who have directed their love towards humanity so as to draw humanity towards heaven – all these are now not only in the vision of God, but they are bestowing their blessing and bliss upon you. All those blessed souls are linked to one another. As from one taper every lamp in the world might be kindled, so from the higher Spirit we call God we derive our life, our light, the life eternal. He is the illumination of all the saints; He is the friend and ideal of all. The light which He directs through all the different spirits runs in one current from the souls of the blessed to the souls of the illuminated ones on earth. There can be no higher spiritualism than this. Since the current is from the one Spirit – even though it reaches us through many, or whether it reaches us from a man, plant, animal, sun or moon, or from whatever apparent source – why seek to differentiate in our search instead of going at once to the source of the current, to the unity rather than among the variety which is illusion? But only those who have reached a certain evolution can realize the next step in this evolution. It is for us to awake only those who are about to awake and allow to sleep peacefully those who are yet fast asleep. They must not be awakened before their sleep is over; they have not had enough, they will feel inclined to awake some other time. It would be like taking a child to a dangerous electric machine. Not only would the child be hurt, but it would spoil the sensitive mechanism of the machine, or it might even destroy a whole factory. The attempt to reform the whole world because one has found out one aspect of the truth is to try and awaken great numbers of people who are not ready to be awakened. Let them sleep on. The ultimate end of the sleepers is the same. They cannot go astray; in the journey through the world of changing experiences they can still know they are going on well. The heart will be enkindled and the torch will be given by which to guide them along the higher paths, and some day all will have found the higher spiritualism when they enter into the joy of the Lord.